If you’ve ever tried to keep a house worth of wooden soffit and fascia painted and looking good, then you know first-hand why people everywhere cover it with factory-finished aluminum instead. This homebuilding option saves so much hassle and looks so good that even wood purists have trouble ignoring the advantages of aluminum up around the eaves. But proper installation isn’t as easy as simply nailing coloured metal onto the edges of your roof. The real challenges aren’t obvious until it’s too late, and they involve two key issues. The first is preventing water from trickling behind the aluminum, causing the roof edge to get wet and rot. You’ll also need to make allowances for this metal’s unstoppable habit of expanding and contracting with changes in temperature. Learn the tricks behind these two crucial details and you’ll enjoy a first-class soffit and fascia installation that endures unchanged for years. You’ll never have to climb up a ladder with paintbrush in hand again. Cladding the eaves of a house in aluminum involves three kinds of factory-finished parts. Soffit fits underneath the roof overhang, and is usually perforated to allow for attic ventilation. A small, trough-shape strip called J-channel caps the edge of the soffit that sits along the wall, while also holding the soffit up and making the area look good at the same time. Fascia covers the outer face of the roof overhang, the parts of the eaves you see most prominently when you’re looking at a building from the side. During installation the fascia slips up underneath any drip edge that’s part of the roofing treatment. The bottom edge of all fascia is bent into an L-shape, hooking over the soffit and holding it secure while making the transition joint look good. Working efficiently with aluminum soffit, fascia and J-channel involves cutting operations that use a combination of hand and power tools. You’ll need a good pair of aviation snips for medium-sized cuts, and a pair of small, first aid scissors for completing tiny cuts accurately. You can’t beat a sliding compound mitre saw for large, repetitive cuts, but the key to success is the blade you use. Although regular, fine-tooth carbide tipped blades are fine for occasional cuts in aluminum, specialty blades made for cutting soffit and fascia slice more smoothly and operate more quietly. For best results, apply a light spray lubricant to the teeth after every few cuts to extend blade life. A power saw is especially useful for all the crosscuts you’ll need to complete on soffit. This material always comes from the factory in long lengths, but that’s not the way it goes up on your building. Short pieces need to be cut to length so they extend across the width of the roof overhang, typically 8- to 18-inches wide. The factory-applied finish on the aluminum you’re working with will last for many decades outdoors, but it’s surprisingly easy to scratch while it’s going up. And with all the metal filings that build up around the saw after just a few cuts, it’s a dangerous place, especially when you’re working with dark brown aluminum. Bright, bare meal shows through with painful clarity when scratched. You can greatly reduce the scratch hazard by installing self-sticking felt pads onto the support arms of the saw. This protects the painted finish on those occasions when soffit and fascia needs to be cut with the finish facing down. Use the kind of felt sold to protect wood floors from furniture feet. Installing these components is the first part of any soffit and fascia job, and in most cases it’s quite simple. Use screws to secure the J-channel tight to walls underneath the eaves, ready to accept and support pieces of soffit that slip into place afterwards. J-channel installation details may vary depending on your situation, though, and that’s where some information can help. If you’re planning to install brick or stone veneer to your building later, J-channel work gets a little trickier. You’ll need to determine the amount of space the veneer requires, then locate the J-channel that same distance from the wall. Snap a chalk line to act as a guide, then fasten the J-channel with screws along the mark. Soffit comes next, but watch out. 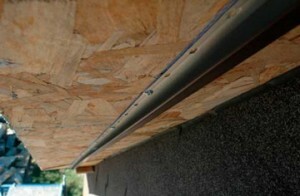 Don’t assume that the lengths of all required soffit pieces are the same. Variations in eaves width are quite common. Measure the area where you’re working to make sure that one size really does fit all. If not, you’ll need to custom-cut soffit pieces to suit. Aim for a soffit length that places the outside edge of the aluminum about 1/4-inch back from the outer face of the eaves. When it comes time to install soffit, slip one edge into the J-channel, then nail the outer edge to the roof frame with a single aluminum nail driven through the bottom of the trough you’ll find bent into the profile. The aluminum nails sold for this job are soft and short, so it can be frustrating to drive them. That’s where a framing nail can help as a tool. It makes a great centre punch for getting nail holes started in pieces of soffit. As you work, always keep rainwater in mind when you’re planning joints and bends. All connections should be overlapped to shed any water that may hit the soffit as it goes up the angled eaves on gable-end walls. Soffit and fascia are made for more than just good looks. 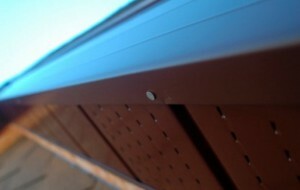 They’re also designed as a weather barrier to keep the edges of roof frames dry. That’s why you need to think a little bit like a roofer when you’re installing it. Next time you have a chance, measure a length of brown aluminum fascia that’s been sitting in the shade, then move it into the hot sun and measure again in fifteen minutes. A standard 12-foot piece expands by a whopping 1/4-inch as it heats up, and this fact affects the most visible parts of installing aluminum properly. When expansion and contraction issues are ignored, wavy, buckled fascia is a constant eyesore. It ripples when the sun shines, and smooths out on cloudy days. You can certainly turn the odds in your favour by installing fascia when it’s already hot and big, but there’s a more important trick than that, and it’s not immediately obvious. Rule #1 for attractive fascia installation is to nail as little as possible and never in the front face of the metal. Ignore this detail, and aluminum’s nasty habit of getting bigger on hot days will cause unsightly buckling and waviness. This is especially important where steep roofs with prominent gable ends remain exposed to view, unhidden by face-mounted eaves trough. Instead of face nailing fascia, tuck it up underneath aluminum drip edge installed around the perimeter of the roof. This offers plenty of holding power along the top edge of the fascia, but only when the approach is coupled with nails driven into oversized holes along the bottom edge of the L-shaped fascia profile. The trick here is using corrosion-proof nails that are long enough to extend securely into the solid wood of the roof frame. Standard aluminum nails are rarely available in the minimum 1 3/4” length required for this approach, and regular galvanized and electroplated nails may react badly with the aluminum in time. That’s why 2-inch long stainless steel nails are the way to go for securing the bottom edge of fascia. Predrill slightly oversized holes aligned with every third groove in the soffit, then hammer the nails home just tightly enough to take up all the slack The fascia is now free to move back and forth with changes in temperature, all without the kind of buckling so often seen on hot days. Even with this information on your side, there are situations where it’s very tempting indeed to install just a few coloured aluminum nails in the face of the fascia. Don’t do it. There’s never any reason to if you opt for a unique alternative. In the interests of good looks and weatherproofing, use polyurethane caulking as a glue instead of face nailing. It comes in colours that match factory finished aluminum, and the long-term holding power of polyurethane is at least as good as nails. Lay down a small bead underneath a joint wherever you’d be tempted to face-nail a joint between pieces of fascia, then temporarily hold the joint together with tape until the caulking cures. I’ve used masking tape and duct tape for this job, but the very best product is the high-strength double-sided No More Nails mounting tape made by LePage. It’s firm, very sticky and doesn’t leave adhesive residue behind when you peel it off in a day or two. Use this approach where lengths of fascia meet on long runs, and where fascia ends at the bottom edge of a roof. As with so many things in the building world, success with soffit and fascia is won in the details. Take the time to make allowances for expansion while also keeping water from sneaking behind the aluminum and you’ll enjoy eaves you can always feel proud of. Q&A: How Can I Shingle a Roof From The Top Down?